Please feel free to save this for future taunting. Forbes is getting into the act, and points out six areas that are BILLIONS upon BILLIONS of dollars that Apple can very easily move into. And the always excellent RakeshLobster points out that the iPad is ALREADY the size of 2/3rds of ALL of Google's business. As someone who held AAPL at $13 (sadly sold at $30), I've been a long time fan. And they are firing on all cylinders without question. But, seriously, something is insane. 1) AAPL is (as of today) 87% ($357B) of XOM's market cap ($410B). I know, I know, one is a growth company and one is not, and the P/E barely indicates any insanity (18 vs 11). But, one has rights to 72 Billion barrels (worth ~$7.2T, unrefined) of a product that has been in heavy use for 140 years, and the other has 21% of its revenue made up of a product it released 18 months ago. Is it just me, or does everything to the right of Q1 2011 (if you leave the iPad out) look kind of, flat? 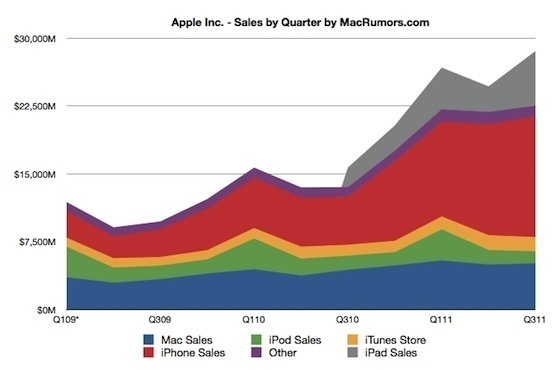 iPhone is taking up more revenue, but Macs and iPods are decreasing at an equivalent rate. True, the iPhone 4 is getting a bit long in the tooth, and a new release will result in new revenue, but still - there are lots and lots of people out there right now who don't have iPhones. 3) I remember the 2000 bubble - one of my favorite stats was at one point Priceline was worth more than United, Northwest and Continental, COMBINED (this, too, is a funny comparison, since another of my favorite stats is the net profit of the airline industry since 1970? Negative $10B). Apple, right now, is worth more than every other company in the world (except XOM). A company where the majority of their product lines and revenue literally did not exist 10 years ago is worth more than all of them. Why? The standard answer is that "it's about future earnings, not the past". And, to this I completely agree. But people talk about the opportunities in China or NFC or getting 100% of the smartphone market not only like Apple is the only player, but like Apple will NEVER lose market share. That's crazy talk. Look, I'm not saying there are not billions of dollars on the table, but something feels hinky here. 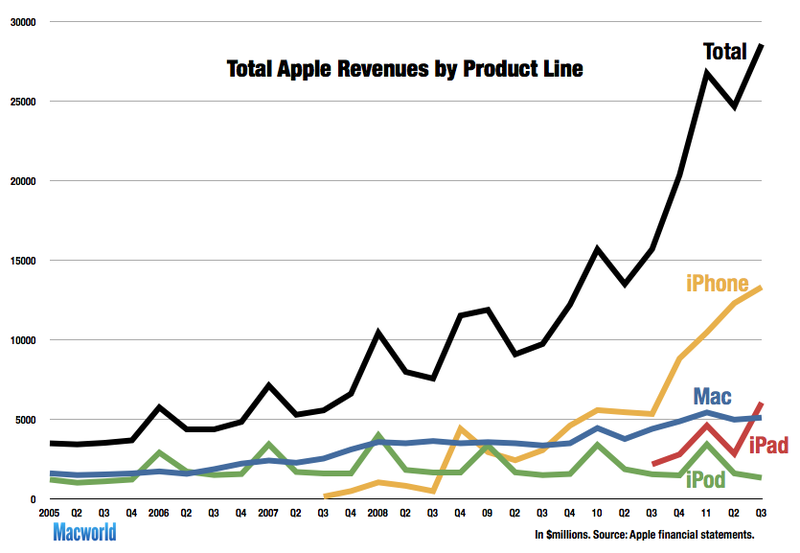 Either XOM is undervalued enormously (and all of these other "real" businesses), or AAPL is overvalued. To have a business that can be built in months means that someone else can do the same. For a counter to my counter-claim, I would recommend the absolutely excellent Seeking Alpha.